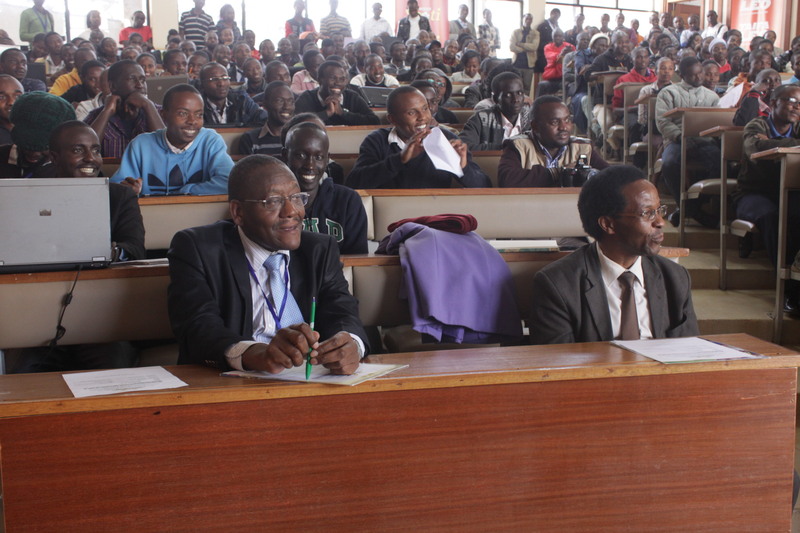 Joshua Kamau. 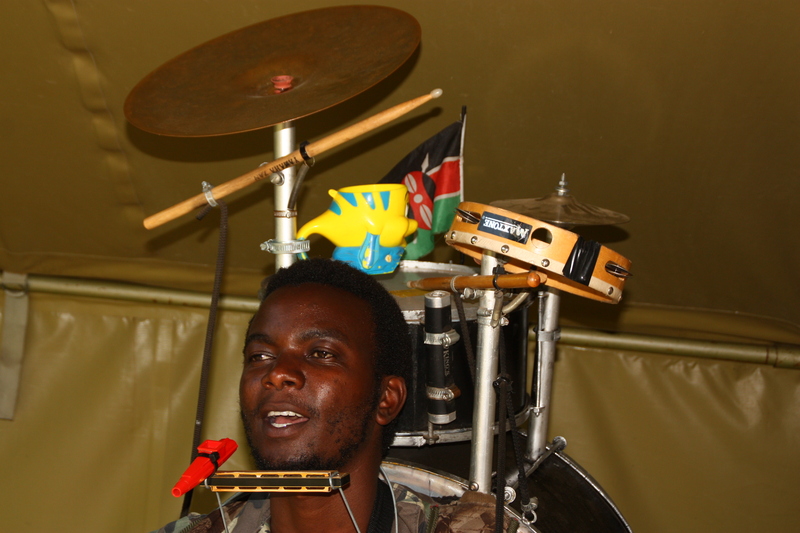 He formed a one man band after his friends showed no interest in forming a band with him (Photo: Kioko Kivandi). 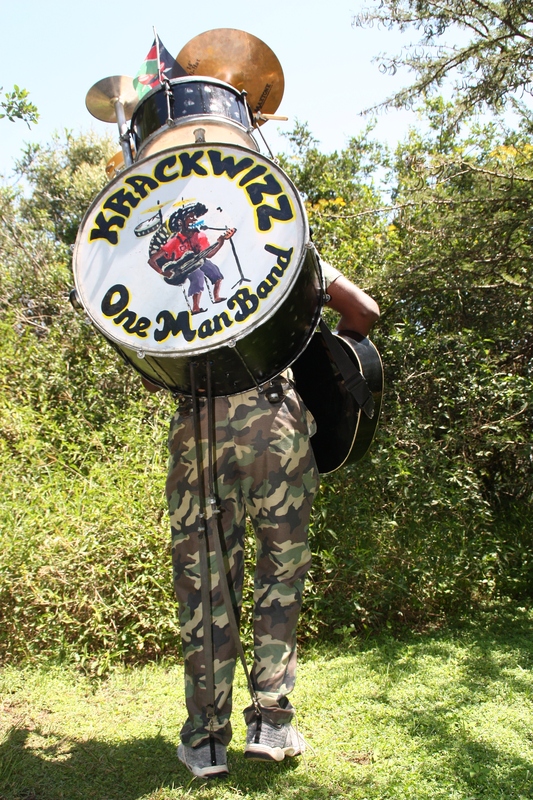 When Krackwizz, Joshua Kamau was let down by his friends after he approached them with the idea of forming a band, he decided not let go his dream of becoming a musician. So instead of locking himself up in a closet he decided to go alone forming a one man band that would later see him get attention even from a corporation that is as big as Safaricom. But perhaps it is because he is so easy to notice. And that out of the way he does his art, or should we say “his thing” – he has more than ten music instruments that he connected together and that he carries on his back all the time during his performances. His sight at times is that of a clown, not until you talk to him and realize he knows what he wants with his life. Added to his singing he says he usually plays 14 instruments, all by himself. 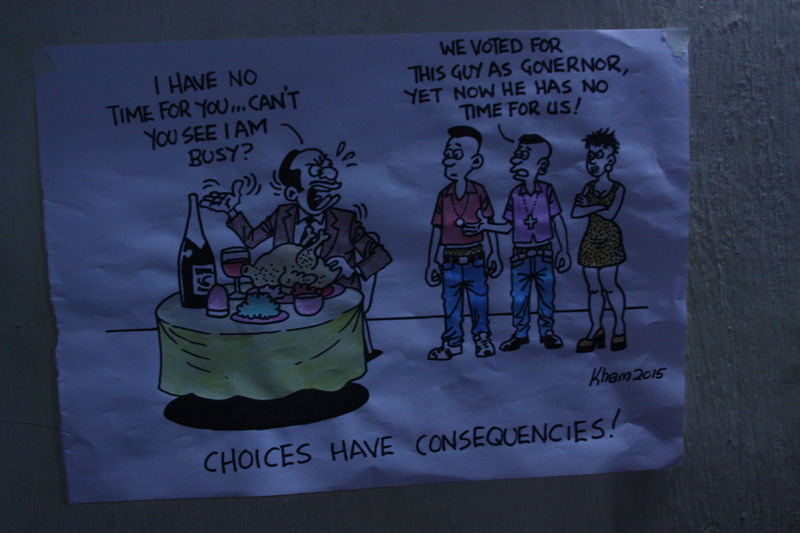 says the 30 year old man who hails from Murang’a county but who currently resides in Kibera, Nairobi. he adds of his music component saying that his first public music performance was in June the same year. That was after his neighbors and some of his friends who saw him perform asked him to try singing in the streets. 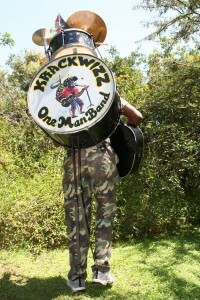 he reflects of the day that brought him his first pay, a cool sh10,000 which he used to buy more music instruments. 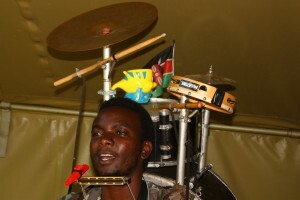 Kamau and his music component which has more than ten instruments attached together (Photo: Kioko Kivandi). But little did he know that he was being noticed. Within no time, Citizen T.V invited him for a show which did help to open up his world as it would see him get invited to other T.V shows in the country. And apart from being featured in a Safaricom advert in which he appeared as an extra, the Music Copyright Society of Kenya (MCSK) invited him to perform at its gala event last year. 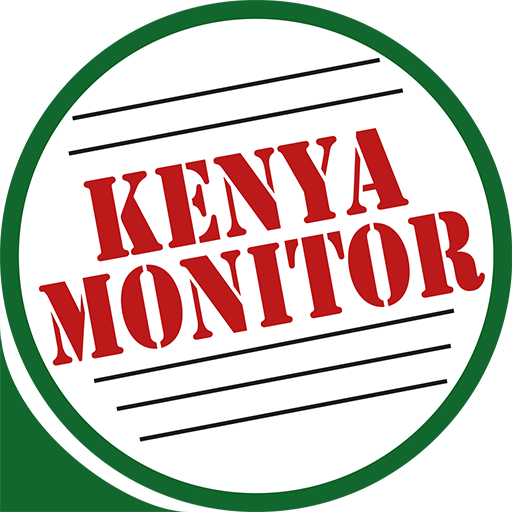 Last week, the Kenya Monitor caught up with him at a camp in which the Institute for Education in Democracy (IED) was training youth from across the country on how to be ambassadors of democracy in their respective counties. He was a trainer at the camp. “I was contracted by IED as a music trainer,” he disclosed. 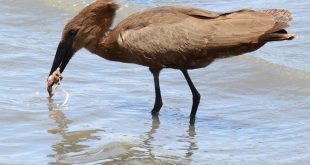 Although as a one man band, who works without a manager, he has been faced with many challenges, he is determined to realize his dream and now encourages other young people to work hard to achieve theirs. he sums up saying that he has made close to a million through his music in the last one year. 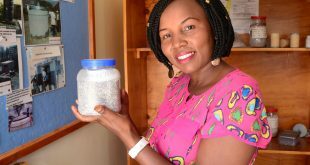 Listening to Kamau’s story one realizes that the world is nothing but an equal stage for anyone who is willing to take part in the act that life is. But above all, it resounds with this unending theme that opportunities only come to those who are willing and have the urge to take to the stage. It’s about thinking outside the box, or more still thinking like the box never existed in the first place. I have learnt something new. Thanks for sharing.